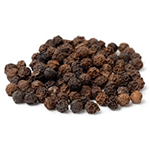 Black peppercorns are usually ground into a fine powder and then used as black pepper powder in recipes. Ground pepper usually loses its aroma faster than whole peppercorns and thus should be stored in air tight containers. Many restaurants thus use pepper mills to crush pepper freshly and use in recipes. Black peppercorns can be used whole or in powdered form as the recipe demands. Product of India.